Epicon Mortar has been designed to comply with the requirements of EN1504 Part 3 Class R3. 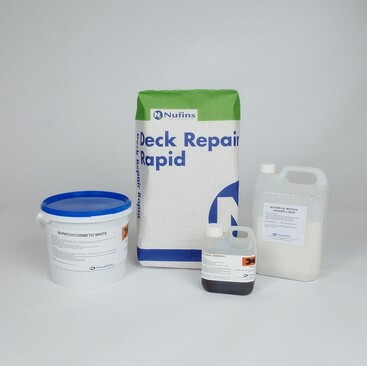 It is an extremely versatile epoxy mortar suitable for a number of building and repair needs where characteristics of excellent adhesive bond, high strength, abrasion and chemical resistance are required. Epicon Mortar is a pre-weighed three component system of solvent free epoxy resin and hardener which, when blended with the graded aggregates, forms a high strength mortar. Repair of worn and damaged concrete floors and stairs. Repair of spalled expansion joints. Repair of concrete and asphalt roads and runways. High compressive, tensile and flexural strength. Excellent adhesion to concrete, stone, asphalt and metal. Provides a non-slip surface with excellent abrasion resistance. Ready for trafficking same day. Tolerant to road salts and freeze-thaw. Non-shrink and grey in colour. Stronger than concrete within 24 hours. To download the Epicon High Strength Epoxy Mortar Technical Data Sheet click here. To download the Epicon High Strength Epoxy Mortar Safety Data Sheet click here.